Microgaming has teamed up with Slingshot in October 2018 to release the Cash of Kingdoms online slot. Though hardly an original themed game, this look at medieval times gives players a further glimpse into history. It has been said that the name of the game is meant to parody Clash of Kingdoms. 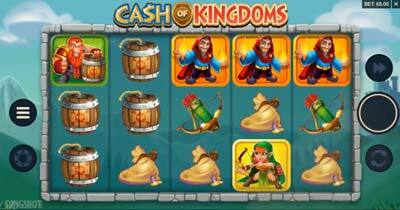 Despite being set in medieval times, Cash of Kingdom is animated much with easy, flat design elements. All of the characters in the game are meant to be cheerful and uplifting. The setting of the game includes a background featuring a mountain with a medieval castle perched atop it. The main symbols used on the reels are the characters, portrayed as medieval heroes. The five main characters are the Knight, Rogue, Bombardier, Mage and Archer. One of these characters is a Viking warrior, the highest value symbol in the game. Non-character symbols used are a treasure chest, a spell book and a bow & arrow. The logo representing the game is its wild symbol. This can become a stacked wild at certain points during the game. Stacked wilds will only ever appear on the second and fourth reels. This also applies to bonus rounds when they become super stacked. One exciting feature of this game is its invading wilds. When the second and fourth reels have stacked wilds they turn transform symbols on the third reel. This leads to more winnings for players, as does the scatter symbol. Represented by the treasure chest, the appearance of three on the reels earns a doubled cash prize. They must be on the middle reels for cash to be awarded. Three treasure chests anywhere on the reels are worth 10 free spins. Any treasure chest that appears during free spins awards one more. The main appeal of Cash of Kingdoms is its easy-going feel. The colourful characters and graphics make the game visually entertaining. Despite a theme that has been done excessively, this game still appeals to players. Its lighthearted mood makes it the perfect game to boost anyone’s mood. The invading wilds are an interesting idea that not every slot machine manufacturer uses. However, Microgaming is known for including new and unusual bonus features players love. This game is no exception, and the invading wilds are the main appeal for many. Though free spins are not plentiful in this game, they are awarded often enough to keep players interested. The hope players have for free spins gets them to keep trying the game, whether for real or fake money. Players will find that this game is easy to learn and enjoy. It can be a great way for new slot players to become used to these games. Even for those more experienced, it provides valuable entertainment. 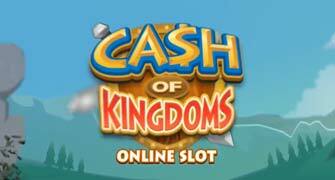 There is something for everyone to enjoy in Cash of Kingdoms. It is one of the new many Microgaming releases that deliver the fun and excitement players seek out.